And you're in for a trip. And the going gets tougher. And there's no going back." I guess we're just natural-born adventure seekers. Most ultra runners are. For the second time in less than a month we headed right into a storm, not because we think we're invincible but because we hoped to miss the worst of it by not becoming sitting ducks in San Antonio. It's called being proactive instead of reactive. On Monday we learned that a polar air mass from Canada was going to create havoc in the warmer Lower 48 states. Not only would it end up dumping several inches of snow in many northern states from coast to coast, it also dipped down into southern New Mexico and Texas. We decided to continue with our original plan to leave San Antonio on Tuesday morning and get as far west as possible before the brunt of the storm reached us. We didn't want to get stranded in San Antonio for several days since our objective was to reach the Phoenix area as soon as possible. Hopefully any snow we hit would melt on the warm I-10 pavement; we'd been having summer-like daytime temperatures most days the past three weeks in Texas. We left Fort Sam a little after 7 AM on Tuesday. It was already 67 F. degrees and predicted to reach the upper 70s before the cold front arrived that evening. By 1 PM we were driving through fat, wet snowflakes at elevations between 3,000 - 4,800 feet and the temperature had dropped to the low 30s! Snow was sticking on the ground but not the road, as we had hoped. Ironically, it was similar to the morning we left Virginia three weeks ago. 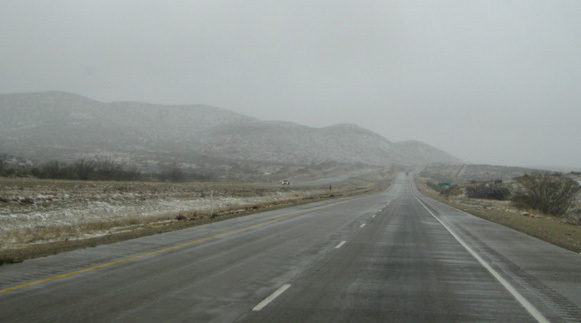 Our quest for warm, sunny weather in the Southwest wasn't quite working out! We got through San Antonio's morning rush hour traffic with no problems (SA is the eighth largest city in the country), following I-10 from the eastern side of town to the northwest corner of the metro area and into the scenic "Hill Country." Only we couldn't see the hills much this time; it was so foggy I could barely see to drive when it was my turn at the wheel. We were more concerned about running into a slowed vehicle than about missing the scenery. Hmm . . . maybe this wasn't such a great idea. 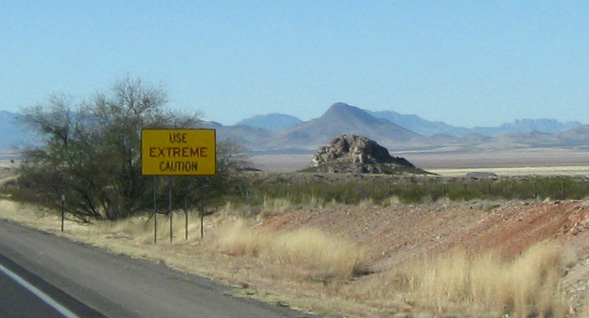 Once out of the city, the speed limit on I-10 is mostly 80 MPH from San Antonio to the El Paso County line. That's a distance of about 550 miles. I thought Montana was the only state where you could go that fast! I don't remember an 80 MPH limit on this road back in January. CRS? It would be reckless of us to drive that fast with the camper on a clear, dry day, let alone in thick fog. 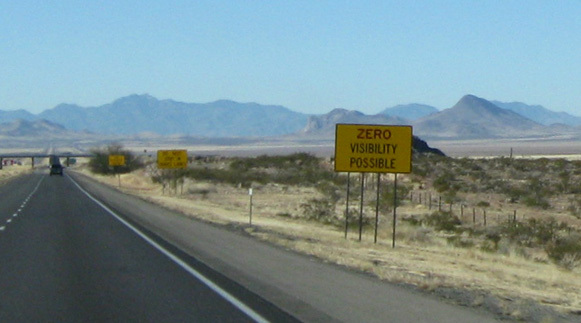 We were glad there was so little traffic on I-10 until we got closer to El Paso later that afternoon. We had enough challenges with the weather -- first the fog, then strong crosswinds as we drove in a northwesterly direction (into the storm), then rain, then snow, with occasional sunshine mixed in here and there. 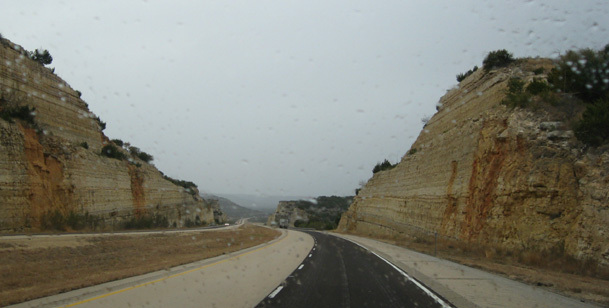 It was fascinating to watch the temperature drop precipitously as we climbed to higher elevations west of San Antonio and drove into the storm. It's supposed to get warmer during the day, not colder -- and not that fast. Certainly not that fast when you're driving somewhere in an east or west direction. But here it was, nosediving from breakfast to lunch. Jim got the bright idea to keep the indoor half of our indoor-outdoor thermometer in the truck with us that day instead of leaving it in the camper. We've securely attached the outdoor sensor to the 5th wheel camper tongue where it's not in the sun; readings aren't completely accurate because the sensor is protected from wind, but they give us a good ballpark idea of the temperature. The 33 F. degree readings we saw were likely even lower in the stiff wind. We totally lucked out with our timing in El Paso. 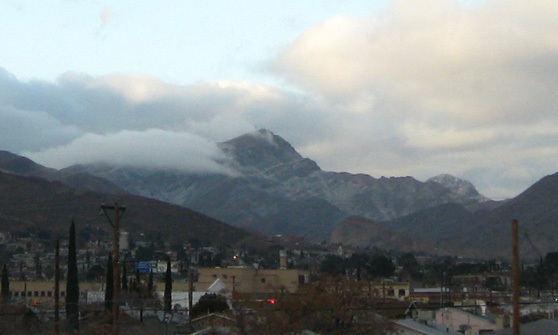 Several inches of snow fell in the metro's Franklin Mountains earlier in the day. Roads were slick and some folks didn't remember how to drive in the season's first snow. I-10 was closed in both directions for several hours due to a jack-knifed semi carrying a load of some type of chemicals. Thank goodness the spill AND the traffic jam was mostly cleared out when we drove through town between 4-4:30 PM. We could see snow on the highest peak but had no idea what had happened until we watched the evening news an hour later in Las Cruces, NM, where we stopped for the night. 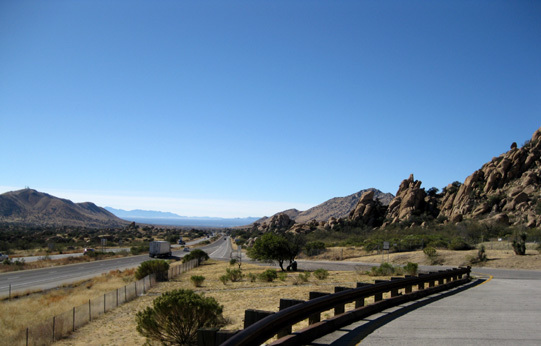 The drive through El Paso and north to Las Cruces is made more interesting by the scenic Franklin and Organ Mountains to the north and east. In January we stayed a couple days at the White Sands Missile Range on the east side of the Organ Mountains when we visited White Sands National Monument. 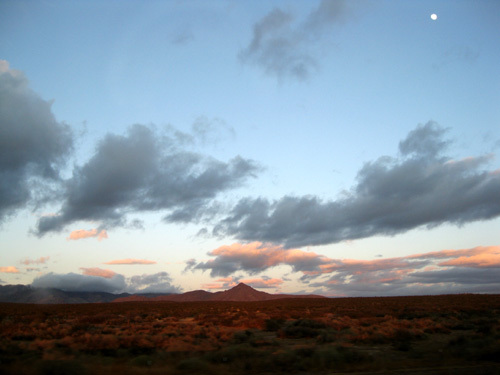 Now we were driving on the west side of the narrow range, watching the setting sun color the flank of the mountains and highlighting the snow in some of the crevices (the highest elevation in the Organs is 8,919 feet). 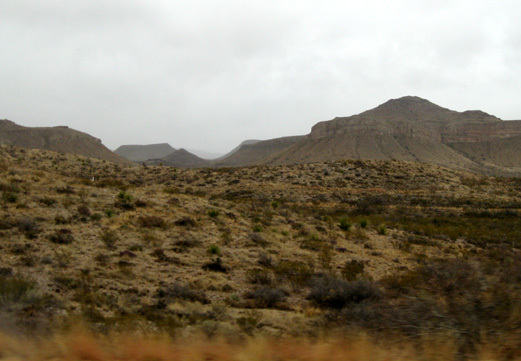 We thought we'd probably be staying at a Walmart, Sam's Club, or Flying J in the El Paso area Tuesday night but we got there early enough that we decided to keep going another 45 minutes to Las Cruces. They have Walmarts, too! A friendly security guard welcomed us to park in a separate lot near the garden area that was well-lit and visible but far from both customer and delivery truck traffic. We had great cell phone and TV reception. I walked Cody in a nearby grassy area and fixed supper while Jim went into the store to buy some supplies. We enjoyed a relaxed evening -- much needed after driving 610 miles that day -- hunkered down in our warm bed while the temperatures continued dropping overnight, and slept soundly (with the obligatory earplugs). We woke to sunshine and an official temperature of 25 F. degrees on Wednesday morning -- brrr!! That's below normal for Las Cruces in early December. We managed to stay warm throughout the night, however, and our water pipes didn't freeze. On one of these trips we need to spend some time in Tucson. I love the nice landscaping and "freeway art" on the overpasses and retaining walls through the city. Phoenix has similar artwork featuring local culture, flora, and fauna. Real shrubs that bloom in both cities in the winter are nice, too. Even when it's cold outside, flowers make it feel like you're in a tropical oasis. The temperatures aren't the only thing that have been falling on this trip. It was no fun for anyone except for the oil cartel last summer when gas and diesel prices peaked (July 11 or thereabouts). We still regret not going out to Colorado and Wyoming for several months this past summer but the fuel prices scared us off. Since then the entire world has experienced serious financial turmoil. About the only bright spot in the economy is the free-fall in the value of a barrel of oil to about one-fourth of the cost in mid-summer. Hopefully the economy will recover in 2009 but fuel prices won't skyrocket again. We're already planning our favorite Wyoming-Colorado trip to run volunteer at our favorite races next summer. Meanwhile, we have our favorite winter race coming up in a couple of weeks -- ATY. 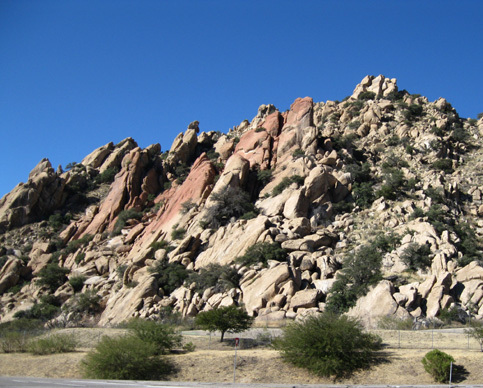 We have found a unique spot to camp (above) at Estrella Mountain Regional Park, about ten miles from Nardini Manor, site of the race. We will be offering as much assistance as needed to the race hosts as they prepare for the largest field of runners in the event's history.